One of the most important issues before Newport Beach residents right now is the revitalization plan of Mariners’ Mile and the widening of Pacific Coast Highway along that area to six lanes. The reason this is such a hot topic is that this area, which encompasses about 1.3 miles, is considered by most residents as the traditional center of the city with its nautical structures and proximity to beautiful Newport Bay. As a result, this revitalization would not only greatly affect the locals who live in the Heights, Cliffhaven, Bayshores and Lido Isle areas, but all of Newport Beach. This traditional area juxtaposed to the opulence of Fashion Island, Big Canyon, Irvine Terrace, Newport Coast and other similar environs makes for the dichotomy of the beautiful and traditional coastal town that those of us who live in Newport Beach have learned to love so well. Are there areas of Mariners’ Mile that would benefit from a revitalization effort? Most decidedly so. But most important, any major changes to this area should only come with input from the homeowners and business owners who reside there, particularly those who will be directly affected. One thing a majority of residents in Newport Beach agree on is that it is their input that should drive any revitalization plans, not the whims of City Hall. 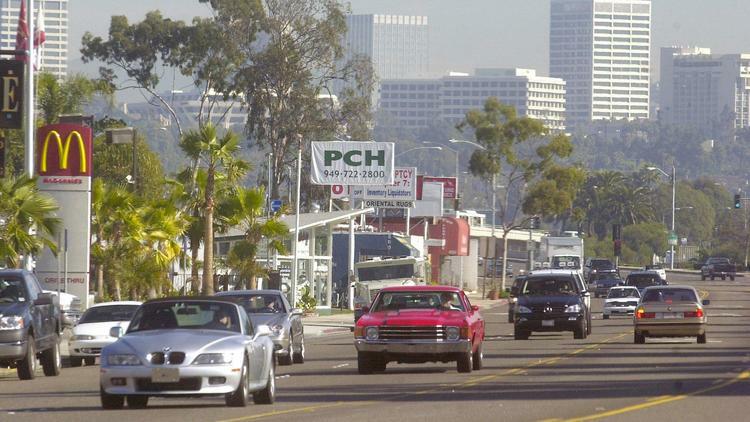 The Newport Beach Planning Commission heard a presentation Thursday night calling for the entire stretch of West Coast Highway known as Mariners' Mile to be three lanes in each direction. The commission did not vote on the matter. Commissioner Kory Kramer abstained from discussing the presentation by Public Works Director Dave Webb because of a perceived conflict of interest involving the Balboa Bay Club, a property in the area acquired by Pacific Hospitality Group, where Kramer is the chief investment officer. Portions of Mariners' Mile, a 1.3-mile segment of West Coast Highway between Newport Boulevard and Dover Drive, currently have two or three lanes, depending on the direction, with parts of the highway used for turn lanes and street parking on the side. The Planning Commission held a study session on the Master Plan on April 20 at 6:30 p.m. in the City Council Chambers, with a minimum quorum of four Commissioners in attendance (PC Chair Kory Kramer appears to be permanently recused from this item due to his management interest in the Balboa Bay Club, Commissioners Zak and Hillgren had excused absences). The consultant made a presentations about the proposed Master Plan and City staff made one about the eventual widening of Coast Highway through Mariners Mile to six lanes. After extensive public input, the Commissioners seemed skeptical about the desirability of widening the highway and uncertain as to whether they would be able to make a positive recommendation on May 18. Staff persisted in asserting that the widening issue was separate from the Master Plan, and the latter needed to be pushed through to completion. A 163 page draft of the “Mariners’ Mile Revitalization Master Plan” has been posted for public review on the City website, here. Mariners Mile was one of several topics presented at a “District 2 Town Hall” conducted by Councilman Brad Avery in the Mariners Branch Library community room. The Jan. 26 Mariners' Mile public workshop at Marina Park was intended to provide residents with a clear vision of what the city and the consultant, Placeworks, have been working on since their last community meeting. It was clear that the city and the consultant have their vision, and this vision was not shared with the community. The same visual presentation was shown, with the same conceptual sketches. Only this time the discussion shifted to phrases as, "building mass," "harbor frontage," "commercial corridors" and "master opportunities." The "master opportunities" were specifically directed at the property owners along Pacific Coast Highway, and this term was further defined as "discretionary actions," "dedications" and "land offers." The third public “workshop” was held at Marina Park on January 26, 2017, at 6:00 pm. Although comments were entertained at the end, this was primarily a presentation by PlaceWorks, the outside firm preparing the new Master Plan. A SPON-produced video of this third public meeting is available here. With very limited parking, and a very steep staircase to climb, the residents of Newport Beach did not disappoint to fill the Newport Beach Sea Base Yacht room to attend a public workshop for the Mariners' Mile Revitalization Master Plan. This was presented by the city's newly appointed consultant, PlaceWorks. The PlaceWorks Professional Service Agreement that was signed by the city states that PlaceWorks will review the Newport Beach General Plan and document its descriptive visualizations for the future of Mariners' Mile. This would include conceptual drawings, templates and outline Mariners' Mile vision and design framework. ​November 14th, 2017, the City Council will accept applications from residents to join the the General Update Plan Committee. Be a part of our future. More details coming soon.